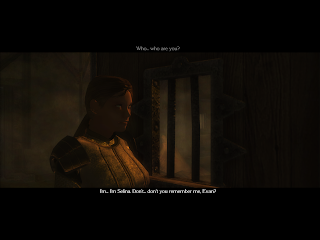 Selina Aermane has been your companion for quite some time now, traveling in the East as mercenaries/adventurers - whatever may have been the case. She is usually always one of the first to give life to a party, except in times of great despair as in the case of Aragaard, where your group was subjected to experimentation. Unfortunately, Selina can often get you into trouble when around wealthy merchants and nobles. Selina is considered the youngest and most juvenile of the available companions. 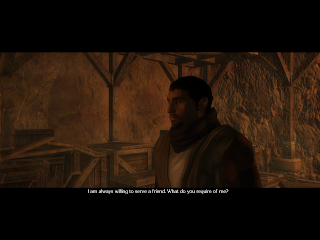 Balthier is one of the few men in the paladin orders of Aglarond to be entrusted with being personal bodyguards of those traveling from the Simbul’s Palace. Bounded by his sworn fealty, it is his soul duty to protect Lady Thalance’s daughter, Arilyn, from harm’s way while she travels to Two Stars to discuss political matters of the trade-routes. He would gladly sacrifice his life for hers if need be. However, Balthier’s tale has only begun. When his group is ambushed, they are captured and thrown into slave camps deep within the sands of Thay. Arilyn had been taken elsewhere and all knowledge of her whereabouts remained a mystery to him for over two years. His faith in the Morninglord hangs on the balance as time marches on and his oath remains broken and unredeemed. Dangerous as the lands of Thay are, as long as his follower’s intentions are the same, he will cope with their behavior (regardless of how foul they may be) until he has fulfilled his oath. (Eventually if the player continues to play an evil character, Balthier will become a fallen paladin and no longer be able to take paladin levels). 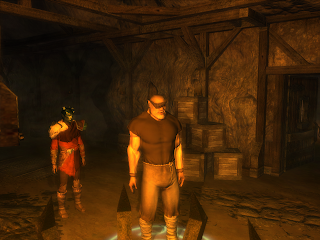 Little is known about this orc's past, other than what he discloses through his stories of other tribesmen, but he remains a loyal and faithful companion. You first meet Krah as your cellmate in Aragaard, and he has kept you company and tended to your wounds for countless months. Krah is rather spiteful towards Thayans for the crimes they have committed against his tribe but moreover their disregard for the dead. Built as a healer and a combatant, Krah makes a great companion in all ways. -Edit: Some typos in Krah's paragraph. Had to type it up really quick before I had to leave. I gotta say, I'm quite intrigued with Krahzgorr Ghrakskull. He's definitely the coolest on the list (IMO). Krah is a pretty interesting and unique character, but not one of my favorites. In Chapter II, there's two other companions that are my personal favorites. I'll mention them after TN1 hits the vault. Balthier De'Avren reminds me of Nines in VTM-Bloodlines yummy! hehe The companions looks great!